Wacktrap's 'Share' feature is located at the bottom of every wack you read. Even your own. We're pretty sure it's one of the most handy tools you'll find. To find 'Share,' make sure that wack's fully expanded by clicking the ‘Read More’ link, fully opening the wack fully. At the bottom of that wack 'Share' is marked by a small orange cross icon. Mousing over 'Share' provides the wack mail option, a super-fast way to get that wack to friends without ever havin' to leave the Wacktrap site. Just look for the tiny envelope. Click that envelope icon in 'Share,' to plug in one or many email address recipients. What if you'd like to send it to a bunch of friends at once? We've got you covered: you can include as many addresses as you'd like, just be sure to separate 'em by a comma ( *****@gmail.com, *****@yahoo.com). Even pop in quick note if you're feelin' like it to let your friends know just what you're really thinkin' about the wack they've gotta read. 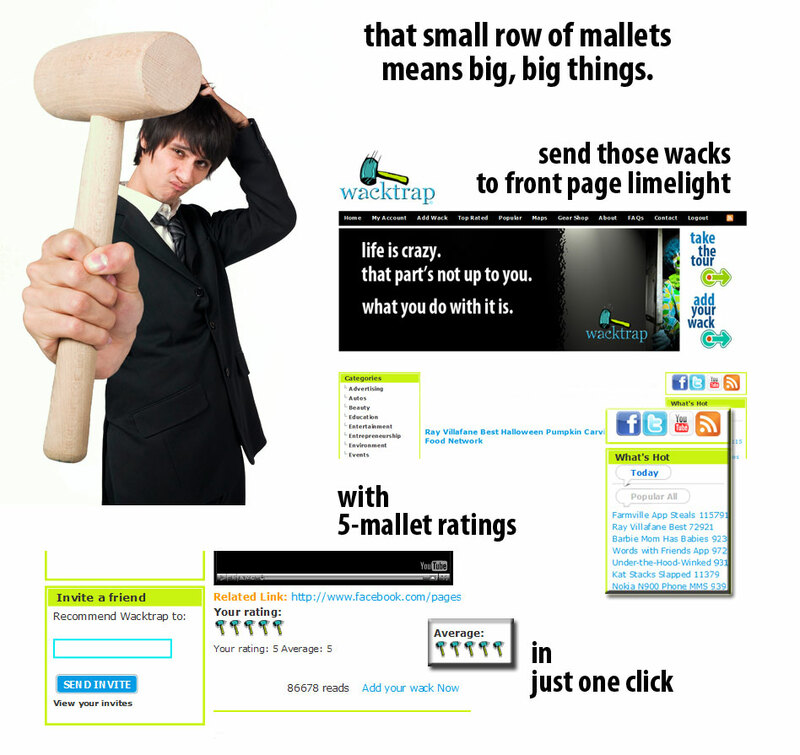 Wacktrap 'Share' features a time-savin' tool for more than mail! Use it to add your wacks to your favorite websites in a blink. Want to add that wack to your Facebook profile? Or want to use Twitter to tweet that wack instead? Maybe you'd prefer to share that wack on the likes of MySpace, Digg, Friend Feed or your favorite social bookmarking site. Whatever your passion, you'll have instant access to sharing any wack-quickly-with more than 150 of your favorite websites.